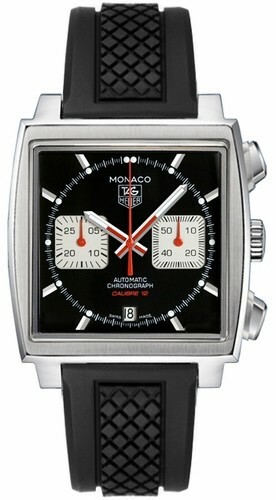 The TAG Heuer Monaco Men’s Watch CAW2114.FT6021 is one of the more popular collections of TAG Heuer products. 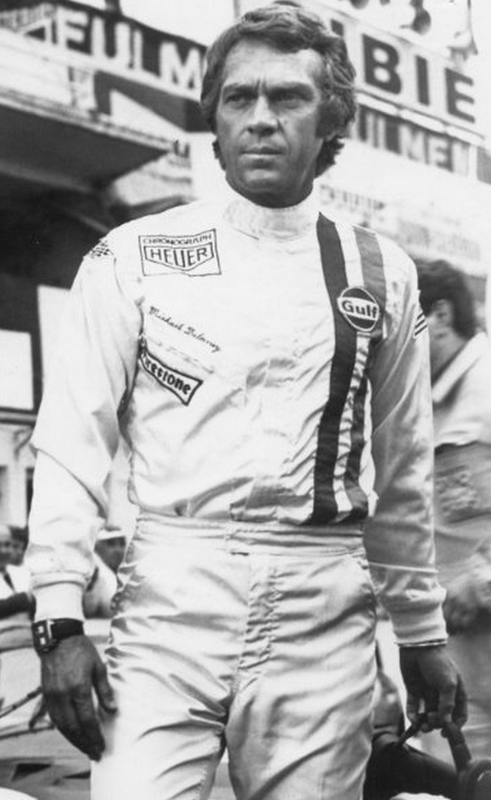 Introduced 1969 in honor of the Monaco Grand Prix, the watch further gained popularity when worn by Steve McQueen’s character in the 70’s race film Le Mans. 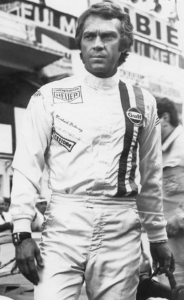 Since then the Monaco series has undergone numerous reissues but still preserves the competitive style of the original. The square design gives the Monaco a sharp and accurate feel. A square design with polished steel case. One central dial with two sub-dials at the 3 and 9 o’clock positions. An automatic movement with back exhibition case. 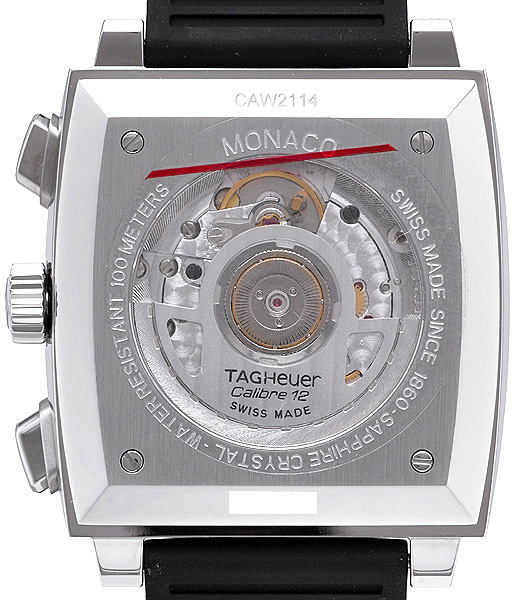 The TAG Heuer Monaco CAW2114.FT6021 has a sharp design from its squared case and inner body dials. The polished steel case accentuates the silver bar markers against the central black dial. All three dials are marked with red extremities to highlight their movement against the black dial surface. The automatic movement is put on display through a back crystal pane. The two sub-dials have white, square bodies and track time by shorter dimensions. The three o’clock dial is a second tracker while the nine o’clock dialtracks time by 30 minute intervals. Both sides can be reset and activated as an independent chronograph with a push of a button. Heuer endorsed a part of the films budget. At the six o’clock is an aperture that reveals the date while the Monaco brand and TAG Heuer logo are superimposed just below the twelve o’clock mark. The automatic movement is revealed in the back through a sapphire crystal plate, allowing for a clear view of the moving mechanics. The Monaco is water resistant up to 100 Meters and highly durable to boot. The only possible drawback is the rubber bracelet which may not hold up as well as steel or leather. The rubber is made to optimize grip which would be expected of diving watches, so the same brand but with a leather strap might give a more genuine feel for the wearer. The Monaco line is a prestigious product with a strong following. There is plenty of variety within this collection for you to find one that suits your need and for a retail price of at least $2,500, you’ll want to pick through the best of them before making a final decision.